The latest on Blu-ray and DVD, including Aquaman, Spider-man: Into the Spider-verse, If Beale Street Could Talk, and Detour. Sarah Knight Adamson reports from Santa Monica, CA on the winners and speeches at last weekend's Critics' Choice Awards. A report from the Golden Globes, where Green Book and Bohemian Rhapsody were the night's big winners. A complete list of winners from last night's 76th Golden Globe Awards. Matt Fagerholm make his case for why "Mary Poppins Returns" is the best reimagining of a Disney classic to date. The best in television for the year. The best films of 2018, according to Odie Henderson. A report from this morning's Golden Globes nominations announcement, and a full list of the nominees. Austin Pendleton and Ann Whitney on "Calumet"; Keeping up with Hugh Grant; Score-only version of "The Last Jedi"; David and Lauren Hogg's new book; Problem with seeking the best for your kids. A review of the excellent A Very English Scandal, starring Hugh Grant and Ben Whishaw, directed by Stephen Frears. 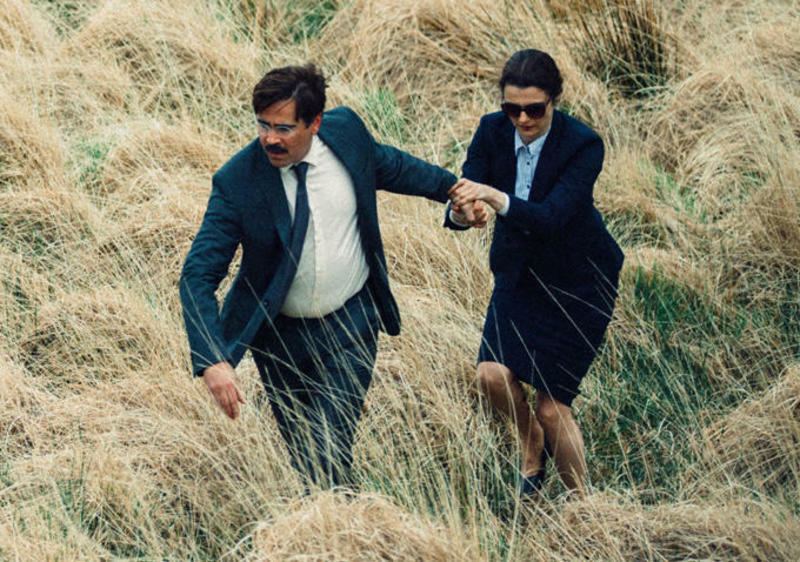 30 Minutes on: "The Lobster"
Depressing and fun. Not a combination you encounter every day. The latest and greatest on Blu-ray and DVD, including Room, The Big Short, Carol, and many more. The latest and greatest on Blu-ray and DVD, including "Bridge of Spies," "Chi-Raq," "Suffragette," "Truth" and more. A review of the three biggest Cannes winners now playing at TIFF: Son of Saul, Dheepan and The Lobster. Venice Film Festival 2015: "The Danish Girl"
A review of Tom Hooper's "The Danish Girl" from Venice. Writer Dan Callahan responds to our Movie Love Questionnaire. Marie writes: Behold an ivy covered house in Düsseldorf, Germany and the power of plants to transform stone, brick and mortar into a hotel for millions of spiders. To view an amazing collection of such images and showcasing a variety of buildings from around the world, visit The Most Colorful Houses Engulfed in Vegetation at io9.com. Skyfall: Hey kids, let's put on a show! "Skyfall" is a theatrical film in the same way that its director, Sam Mendes, is a theatrical filmmaker. That is, its approach to organizing space for an audience (the camera lens) is noticeably stagey. I mean that in a "value-neutral" way. I just mean the frame is frequently used as a proscenium and the images are action-tableaux deployed for a crowd -- whether it's the designated audience surrogates in the movie (bystanders or designated dramatis personae), or the viewers in the seats with the cup-holders. That's not to say it's uncinematic (it's photographed by the great Roger Deakins! ), but many of the set-pieces in "Skyfall" are conceived and presented as staged performance pieces. I'm double-posting my review of "Skyfall" to encourage comments, which my main site can't accept. In this 50th year of the James Bond series, with the disappointing "Quantum of Solace" (2008) still in our minds, "Skyfall" triumphantly reinvents 007 in one of the best Bonds ever made. This is a full-blooded, joyous, intelligent celebration of a beloved cultural icon, with Daniel Craig taking full possession of a role he earlier played well in "Casino Royale," not so well in "Quantum"--although it may not have been entirely his fault. I don't know what I expected in Bond #23, but certainly not an experience this invigorating. From the Grand Poobah: Here in Michigan Oink's ice cream parlor exerts a magnetic pull on helpless citizens for miles around. I can no longer sample their countless flavors, but not log ago I took Kim Severson there. She is a New York Times writer doing a piece on The Pot. Oink's is run by my friend Roger Vink, who says, "May the Oink be with you." May 20, 2009-The premiere of Quentin Tarantino's "Inglourious Basterds" will likely dominate the international press for days. The screening itself was a bit less than a crazy event than I had been expecting. After experiencing the wild, all-out adoration of Tarantino fans at a special Cannes screening of "Kill Bill I and II" some years ago, in which the audience consisted largely of French locals, I was prepared for anything. The guards opened the Grand Theatre Lumiere a half-hour early, and even though I arrive at 7:55 am for the 8:30 am screening, it was already half full. Mild excitement was in the air, some cheers and applause were heard as the lights went down, and another smattering of applause when Tarantino's name appeared on the screen. I was waiting for some kind of massive reaction at the end, but there really was nothing out of the ordinary. I've never been overwhelmed by Tarantino's films, although the crazed eclecticism of his work is a lot of fun. "Inglourious Basterds" worked for me as a satisfying whole better than most of his other films. He pulls together everything in his arsenal: action, extreme violence, misogyny, film history, pop music and pop culture, and a plot based on a wild premise that rewrites history.